I thoroughly enjoyed putting together my 26 posts on Norse Mythology during this year’s A to Z Blogging Challenge. So much, in fact, that I feel I need to take additional steps in my research. For example, one resource I didn’t run across that I would like to find is a timeline for the tales. I know, for example, that any tale involving Hoenir traveling with Odin around the cosmos must have taken place before the Aesir-Vanir war since Hoenir was one of the two Aesir turned over to the Vanir as a hostage when the two god clans declared they no longer wanted war. I’d like to find–or create myself–a timeline for the stories. I found many sources, some scholarly and some more accessible to the mainstream audience, with far more detailed and credible information than the superficial thoughts I collected for my blog posts. If you are interested in learning more about Norse mythology, I recommend the following books and other resources. I’ve read two of the books below and plan to read the third as well as dip often into the website listed at the end of the list. Norse Mythology by Neil Gaiman. Once you have read this book by Gaiman, take a look at his others, especially American Gods and Anansi Boys to see how he injects myths of many cultures into his fictional works. Then go out and see a few Marvel movies to see how Norse mythology has been woven into popular culture, movies such as Thor; Thor: Ragnarok; Thor: Tales of Asgard; and Thor: The Dark World. If you are in an area where a Viking or Scandinavian festival is held, check it out. There are many held each year in Norway and at least one big one in York, England. Here are a few I could find around the country. Scandinavian Hjemkomst & Midwest Viking Festival, Clay County, MN, June 22-23, 2018. At this one you can also see the full-size replica of a Viking ship built by my eighth-grade science teacher as well as a replica of the Hopperstad Stave Church. I hope you enjoyed learning about Norse mythology as much as I enjoyed digging deeper to uncover the basis for the many folktales and folk characters I recalled hearing about in my childhood. I feel well prepared to begin conversations, or at least small talk, during my upcoming trip to Norway about the origins of place names, for instance. As a native introvert, I need all the conversation-opening gambits I can find to engage with strangers. Thor (Old Norse Þórr, Old English Đunor, Old High German Donar, Proto-Germanic *Þunraz, “Thunder”) is one of the most prominent figures in Norse mythology. He was a major god of all branches of the Germanic peoples before their conversion to Christianity, although he reached the height of his popularity among the Scandinavians of the late Viking Age. Everybody tells me they love Thor. But these days, it is more likely Chris Hemsworth, star of the Marvel Thor movie franchise, that they mean. Thor is one of Odin’s sons. Odin is known by many names, including Allfather, which suggests he is the father–or at least the eldest and wisest–of all the gods. For both reasons, it would seem Odin is the more powerful of the two. But that isn’t necessarily so. Odin appeals to those seeking the power to rule, to divine the future, to use magic to change what is. He travels around the cosmos, often in disguise or at least using names to hide who he is, in search of knowledge and wisdom. He demonstrates his power through wit and ability to out-think and out-maneuver those he encounters. Though one tale exists where Thor dresses as a woman in order to regain his hammer, in general Thor travels without disguises. He is easily identified by the two goats who draw his chariot and his hammer ever at the ready. Thor appeals to those who wish to rain down might on their foes in order to defeat them. Those in power may wish to appeal to both gods. Those not in power look to Thor for protection. Old Norse society was generally divided into three classes: those who ruled, those who battled, and all the rest including those who farmed, fished, built, or served others. Odin appealed to the first group–those who ruled (or wished to rule). Thor appealed to the other two classes. Over time, the number in the first class grew smaller while the other two grew larger. Perhaps for that reason, by Viking time, Thor’s popularity exceeded Odin’s. As the Viking timeframe overlapped with the spread of Christianity across northern Europe, it appears Thor’s hammer, Mjöllnir, became a symbol of resistance against Christianity. While converts to the new religion wore crosses around their necks to announce which religion they followed, people of the Viking era wore amulets in the shape of Mjöllnir around their necks. Another explanation for why people of the Viking age might have equated the wearing of Thor’s hammer with Christians wearing crosses is that Thor used his hammer not simply in battle to defeat enemies. His hammer also was important for hallowing the ground to ensure bountiful harvests. No wonder people love Thor. Orel, Vladimir. 2003. A Handbook of Germanic Etymology. p. 429. At the center of the Norse spiritual cosmos is an ash tree, Yggdrasil (pronounced “IG-druh-sill”; Old Norse Askr Yggdrasils), which grows out of the Well of Urd (Old Norse Urðarbrunnr). The Nine Worlds are held in the branches and roots of the tree. The name Askr Yggdrasils probably strikes most modern people as being awkwardly complex. It means “the ash tree of the horse of Yggr.” Yggr means “The Terrible One,” and is a byname of Odin. The horse of Odin is Sleipnir. This may seem like a puzzling name for a tree, but it makes sense when one considers that the tree as a means of transportation between worlds is a common theme in Eurasian shamanism. Odin rides Sleipnir up and down Yggdrasil’s trunk and through its branches on his frequent journeys throughout the Nine Worlds. “Urd” (pronounced “URD”; Old Norse Urðr, Old English Wyrd) means “destiny.” The Well of Urd could therefore just as aptly be called the Well of Destiny. The tree of life. The tree of the knowledge of good and evil. The tree of Odin’s horse. All images of trees at the center of the world. Many ancient cultures include a central tree with fruit conveying immortality or wisdom or other desirable qualities. In Persian and Zoroastrian traditions, there is Gaokerena, threatened by a frog and guarded by kar fish. The juice made from its fruit conveys immortality. In the Kingdom of Ararat, carvings of the tree of life appear on the walls of fortresses. The first book of the Bible, Genesis, refers to both the tree of life and the tree of knowledge of good and evil. The serpent tricked Eve into tasting the fruit of the tree of knowledge of good and evil, and then Eve convinced Adam he too should eat the fruit. Their punishment was to be expelled from the Garden of Eden where the tree of life remained, guarded by angels with flaming swords. Buddha sat under a sacred fig tree, also known as the Bo or Bodhi tree, when he attained enlightenment. In Chinese mythology, the tree of life is depicted with a dragon and a phoenix. Every three thousand years, the tree produces a fruit which when eaten gives the eater immortality. In Islam, the Garden of Eden contains the tree of immortality, and it is this tree that God forbade Adam and Eve from eating the fruit. In this version as well, the serpent seduced Adam and Eve to eat from the tree, disobeying God. Native American Indian tribes often include tales involving trees, such as the Grandmother Cedar tales of the Sammish and Ojibwa tribes. With all those other societies including stories of sacred trees to explain creation, the desire for immortality, the consequences of disobeying God, and other important life lessons, there should be no surprise to learn that a tree–perhaps an ash, perhaps a yew–holds together the mythological cosmos of the Norse and Germanic ancient culture. Odin travels to all levels of the cosmos on his horse, Sleipnir. Not all creatures of the cosmology can travel beyond their home levels, which explains why so many of the tales involve the Aesir and Vanir traveling to the homes of the elves, the dwarves, and the giants, but not often the other way around. Simek, Rudolf. 1993. Dictionary of Northern Mythology. Translated by Angela Hall. p. 375. Eliade, Mircea. 1964. Shamanism: Archaic Techniques of Ecstasy. Translated by Willard Trask. p. 37. The Poetic Edda. Grímnismál, stanzas 32-34. Valhalla (pronounced “val-HALL-uh”; Old Norse Valhöll, “the hall of the fallen”) is the hall where the god Odin houses the dead whom he deems worthy of dwelling with him. Norse mythology includes several places where the dead go. Odin’s hall, Valhalla (Hall of the Fallen), and Hel’s underground domain, Hel (the Hidden), are the most well known, but perhaps that is more due to the influence of Christianity which introduced heaven and hell as the reward and punishment meted out according to how humans lived during their lifetimes. There are also Freya’s hall, Folkvang (Field of the People), and the underwater abode of the giantess, Ran, where those who drowned were sometimes gathered. More is known about Valhalla than the other places. Valhalla is where Odin chooses the best of the fallen warriors, brought to him by the valkyries, to live with him until Ragnarok. Once there, they become einherjar, those who fight alone. While there, the einherjar do what warriors do best–they fight. Each evening their wounds and injuries are healed, and they feast and drink. And so life-after-death goes on. Simek, Rudolf. 1993. Dictionary of Northern Mythology. Translated by Angela Hall. p. 346. The Vanir (Old Norse Vanir, pronounced “VAN-ear”) are one of the two principal tribes of deities featured in Norse mythology. (The other tribe is the Aesir.) 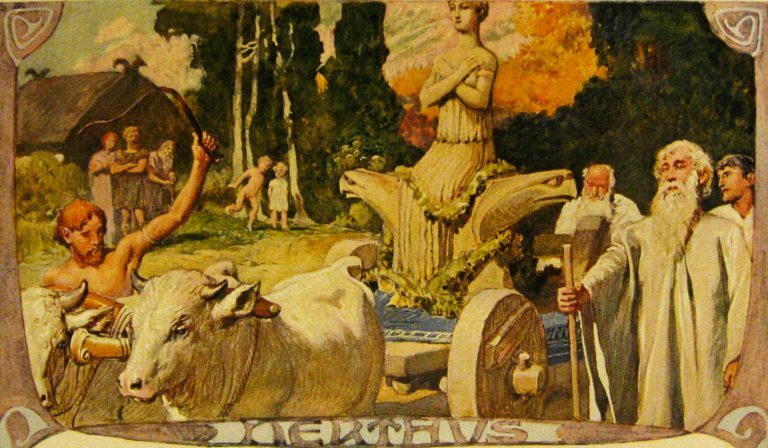 Among their ranks are Freya, Freyr, Njord, and arguably the early Germanic goddess Nerthus as well. Their home is Vanaheim, one of the Nine Worlds held within the branches of the world-tree Yggdrasil. While the Aesir were known for their warlike nature and fighting ability, the Vanir were known for their powers over the sea and the fertility of the land. Why the two groups were so much at odds with one another isn’t clear since cooperating seems a sensible solution for both groups to be protected (through the powers of the Aesir) and able to propagate and fill the land (through the powers of the Vanir). But never mind. Eventually both sides recognized the strength of the other and decided continuing battles were counterproductive. Thus ended the first Aesir-Vanir War. About the only Vanir recorded in the Poetic Edda are those mentioned by Daniel McCoy in the above introductory paragraph. The Vanir gave Njord and his twin children, Freyr and Freyja, as hostages to the Aesir as guarantee of their good will at the end of the war in exchange for the pair Hoenir and Mimir given by the Aesir to the Vanir. From that point on, the three Vanir gods become integrated into the world of the Aesir. 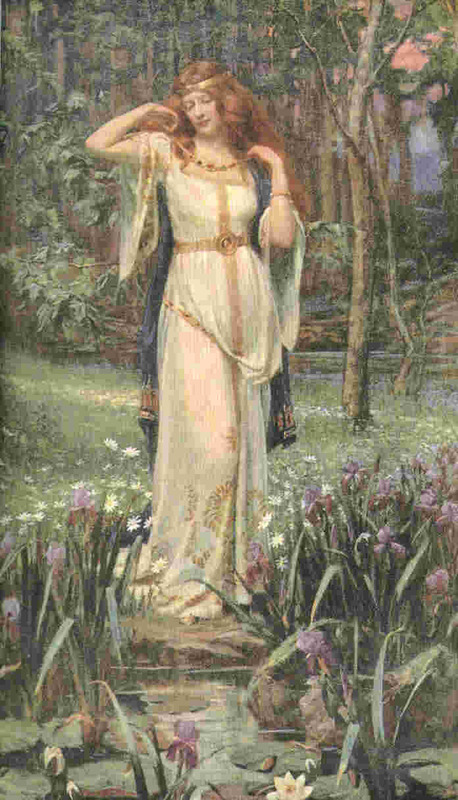 So much so that it is not clear whether Freyja and her husband Odr are not in fact Frigg and Odin. McCoy, Daniel. Norse Mythology for Smart People, article on Nerthus. Ullr (pronounced “ULL-er,” often Anglicized as “Ull,” and also occasionally referred to as “Ullinn”) is an obscure and enigmatic Norse god. References to him in Old Norse literature are sparse and tell us little to nothing about his personality or role in pre-Christian religion and mythology. Nevertheless, these passing references indicate that he was once a deity of considerable importance, even if we don’t know why. Okay, I admit it. I picked U is for Ullr because I couldn’t find any other name that begins with U. The only place name I could come up with is Uppsala, but that’s in Sweden, and I will be traveling to Norway. And most of the resources I could find having to do with Uppsala are disputed by others. So I’m sticking with Ullr or Ull. He is listed among the gods in the Poetic Edda. He was the son of Sif and the step-son of Thor. He was known for his skiing and his archery skills. But there are no known stories that include him. But even he has made his mark on modern culture. Ski patrols in parts of Europe wear a medallion with Ullr’s image, on skis, and carrying a bow and arrow. Breckenridge, Colorado, hosts a Ullr fest each January, supposedly to gain his favor and plenty of snow for the rest of the skiing season. There is even a New Zealand TV program that ran from 2011 to 2013, The Almighty Johnsons, based on the premise that a man woke up on his 21st birthday and discovered he and his family were reincarnated Norse gods who don’t yet know how to control their powers. And Ullr was one of the gods in the main character’s family. Clearly important. And there are many place names in Norway that include his name, something for me to look for during my travels there. 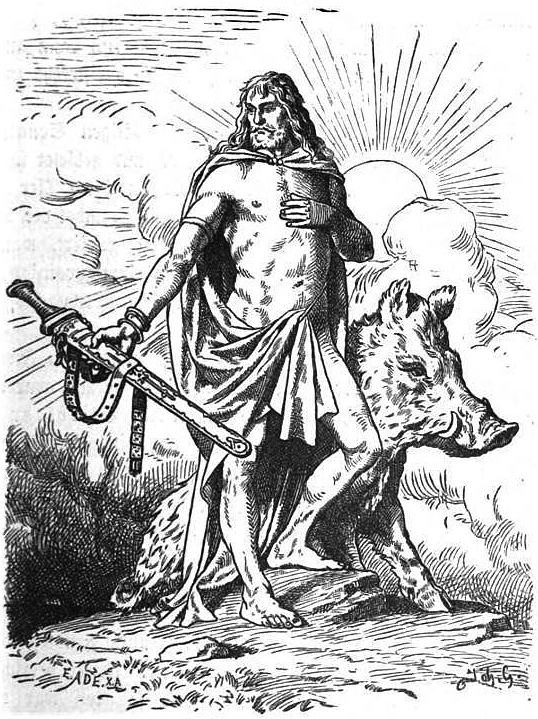 Tyr (pronounced like the English word “tier”; Old Norse Týr, Old English Tiw, Old High German *Ziu, Gothic Tyz, Proto-Germanic *Tiwaz, “god”) is a Norse war god, but also the god who, more than any other, presides over matters of law and justice. His role in the surviving Viking Age myths is relatively slight, and his status in the later part of the Viking Age may have been correspondingly minor. But this wasn’t always the case. Other kinds of evidence show us that Tyr was once one of the most important gods to the Norse and other Germanic peoples. Tyr’s sacrificing of his hand parallels Odin’s sacrificing of his eye in some ways. Where Odin’s sacrifice was in search of wisdom, Tyr’s was in defense of justice. For if the gods had succeeded at binding Fenrir through trickery, there would be no justice in their actions. While references to Tyr are scant in the Poetic Eddas, there is evidence that the Romans knew of him and considered him to be the same god as Mars. The fact that in Latin languages the name for the third day of the week (Mardi in French, martes in Spanish, martedì in Italian) is based on the name of Mars, in Germanic languages the name for the same day (Tuesday in English, Dienstag in German, tirsdag in Norwegian and Danish, tisdag in Swedish), is based on Tyr, though the German version relies on a Latin version of the name for Tyr and the others go back to an alternate spelling, Tiw. One of the runes in the Futhark alphabet (named by spelling out the first letter of the names of the first six runes where th represents one rune) is Tiwaz, the Proto-Germanic spelling of Tyr’s name. The rune means victory and honor. This connection with Tyr represents both his status as a god of war and of justice. In other words, he must have been an important god, though few tales remain. de Vries, Jan. 2000. Altnordisches Etymologisches Wörterbuch. p. 603. Orel, Vladimir. 2003. A Handbook of Germanic Etymology. p. 408.